Youtube, world’s best video sharing site is browsed by millions daily and it can become a good source of income if you have some outstanding videos. Recently I got a mail from Youtube, which was a invitation to earn revenue from YouTube videos. It seems that they are sending the mail to those who are having Google Adsense account, linked with their Youtube account. You will need to use the same email address for Youtube and Adsense account. In the mail received, there would be a link so that you can review and complete the process to apply for monetization. Just follow that process and complete the steps. After completing this process, you will have successfully applied for Youtube revenue sharing program. They will review the application and then approve your account, if everything goes well and as per their terms and conditions. It will take Youtube 48 hours to review your account, and then you can start making money from Youtube videos. You own or have express permission to use and monetize all audio and video content that you upload—no exceptions. If they reject your submission they might flag your video for copyright infringement. Don’t use AudioSwap feature of Youtube, else you won’t be able to monetize those videos. You must have or create a Google Adsense account to be able to receive the money. If you don’t have one, then you can create one. So go ahead and read this getting started guide. After reading this guide, now its time to select which videos are monetized. Yes, by default it won’t monetize all the videos, so you will need to select which particular videos you want to enable for revenue sharing. Login to your account and click on My Videos and now you will be able to see all the uploaded videos. 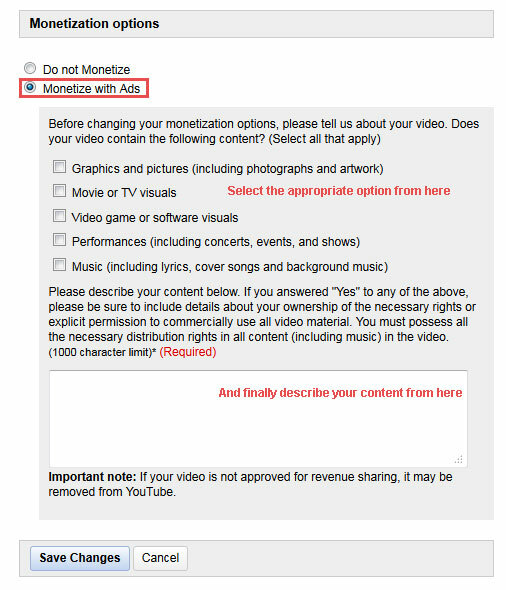 After your video is monetized, you will see that in “My Videos” section, the button will be changed into “monetized”. This means that ads have started appearing on your video. Congratulations. The ads will be placed next to the video and also in the video as a small popup which can be closed by clicking on that small “x” button. So this is how revenue sharing works on Youtube. You can track your earnings in your AdSense account on the Reports Overview tab. Since your ads are served by Google AdSense, you will find your earnings listed in the “AdSense for Content Host” section. You will get paid by Google Adsense once your account exceeds $100. So those Bloggers, webmasters or persons who have uploaded many videos on Youtube can take benefit from this revenue sharing program and can earn from Youtube. You won’t be becoming rich, but at least you can try out how this program works for you.